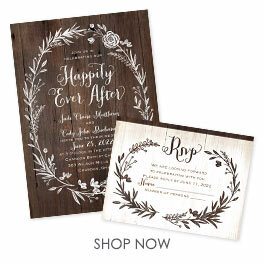 You are bound to fall in love with these wedding invitations with whimsical flourish accents and hugging hearts design. Design is printed in the same ink color as your wording. Separate and send invitations come with two detachable enclosure cards (respond card and reception card) on one convenient sheet. They also come with invitation envelopes and respond card envelopes for a complete, coordinated stationery set. Special Note: Separate 'n send enclosures are perforated for detaching from invitation. Paper weight is 171# text. Special Note: Separate 'n send enclosures are perforated for detaching from invitation. Size: Invitation: 5 1/8" x 7 1/4", Response and Reception Cards: 4 7/8" x 3 1/2"
Please Note: Sep 'n Send™ enclosures are lightly perforated for detaching from the invitation. These invitation were so gorgeous! I loved mine on the adorable shimmer paper. I couldn't imagine a more perfect invitation set for me! These invitations came out so beautiful! We ordered them in heavy matte in the claret and black ink color with claret lined envelopes. We were also pleased with the simplicity in managing the separation edge. We loved this prouduct . You can not beat the quality for the price, we ordered the Love bound seperate and sent invitation for my daughters valentine's day wedding . They were perfect .We were a little worried aboutthe seperation edge and if it would be real noticeable its not!! Its a great prouduct for a great price.